From reliable positioning and identification to guaranteeing smooth processes in safety-critical applications—discover our comprehensive portfolio for the automotive industry. 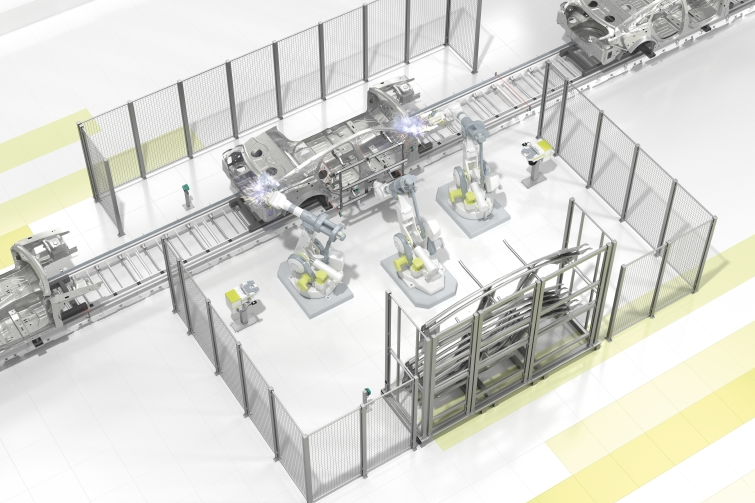 Pepperl+Fuchs offers a comprehensive, user-friendly portfolio of solutions that can be seamlessly integrated into every stage of automotive manufacturing. Pepperl+Fuchs ensures reliable positioning and makes processes smoother in safety-critical applications. New products that meet the demands of the automotive industry are continuously being developed. Whether positioning skids and lifts over long distances or controlling steering for automated guided vehicles, our comprehensive portfolio offers the ideal sensor solution for every positioning task. Our sensor solutions can tackle numerous conveyor technology tasks in the automotive industry, including skid entry control in work areas and collision protection for monorail conveyors on both curves and straightaways. Sensor technology from Pepperl+Fuchs is used for identification in body shops, during final assembly, and in extreme conditions like those in high-temperature zones in paint shops. High precision is required for the automated feeding of individual components, such as removing car doors from racks for further processing. Different technologies enable reliable and precise component monitoring. 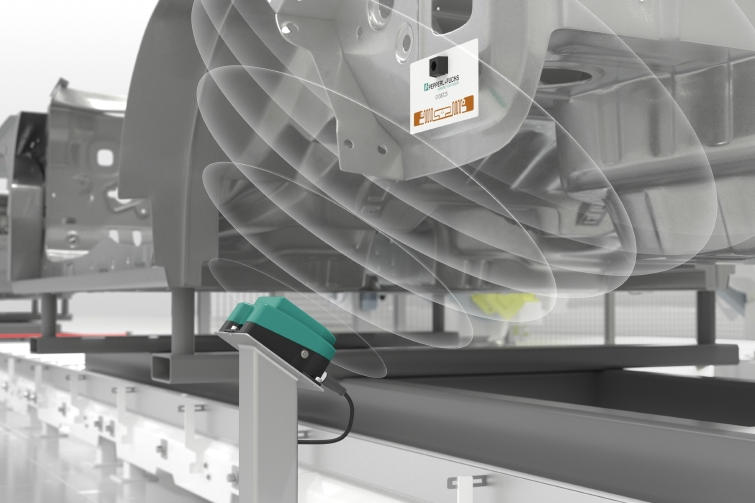 Sensor technologies from Pepperl+Fuchs ensure both personal and machine safety in automated areas, whether guaranteeing smooth processes on monorail conveyors or for automated guided vehicles. The future-proof, cross-vendor interface enables comprehensive diagnostics and is easy to configure during operation via the control system. Pepperl+Fuchs offers you an end-to-end IO-Link solution that includes a range of IO-Link sensors and the appropriate infrastructure. 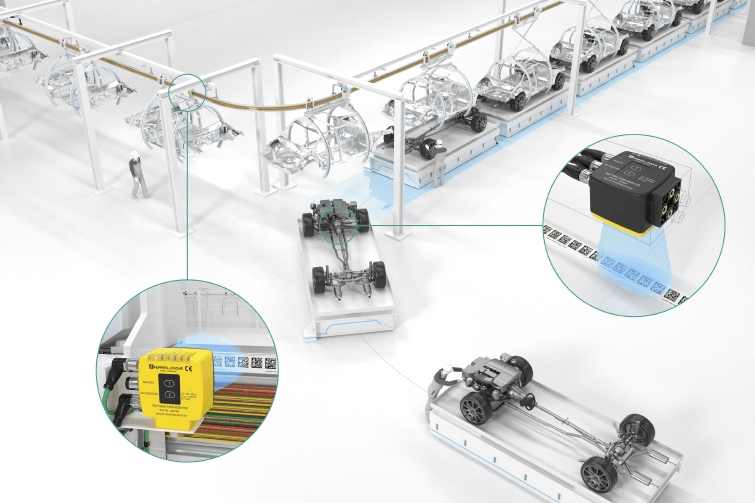 The PXV absolute positioning system combines a 2-D camera system with a multi-redundant Data Matrix code band for reliable positioning of skids or monorail conveyors. PGV absolute positioning systems ensure exact tracking of automated guided vehicles when painted car bodies are being mounted on chassis. In body construction, lifts transport car bodies across several levels. In this production step, VDM100 series distance sensors enable extremely fast and exact positioning, even over long distances. The R2000 Ultra High Density 2-D LiDAR sensor delivers high-precision measurement data in dynamic applications. This includes, for example, navigation of automated guided vehicles in body construction, assembly, and material supply. In automotive body shops, side parts of car bodies are transported on monorail conveyors. The VDM28 distance sensor measures the distance between individual parts using Pulse Ranging Technology and prevents them from colliding. The 88-degree scan area of the rugged R2100 LiDAR sensor makes it possible to measure the distance between individual parts on monorail conveyors—even with irregular surfaces and curves. Feeding skids into weld cells requires precise position detection. R20x series photoelectric sensors can detect highly reflective surfaces and slow down or stop the skid feed if necessary. Before the side parts of a car can be welded, F190 RFID UHF read/write heads test whether the racks along the welding line contain the proper parts for the current car body. In the high-temperature areas of paint shops, there are special production conditions with regard to temperature and contamination. The metal code sheets of the rugged OIT high-temperature identification system withstand temperatures up to +500 °C and enable reliable identification. During final assembly, cars are conveyed on skillets through the manufacturing plant. F190 or F192 UHF read/write heads are mounted at different stations to detect car and part assignment, work processes, and quality data over long distances. RFID technology makes it possible to identify individual hangers on monorail conveyors. To assist with this, read heads are mounted on the conveyor rail and tags are installed on the hangers. In weld cells for auto body shell construction, car doors hang on so-called racks. At the end of these racks, two F77 series ultrasonic sensors reliably detect removal of the last car door. Weld-immune reduction factor 1 sensors detect body parts made out of different metals. They are extremely resistant to interference from weld spatter, magnetic fields during electric welding, and other such influences. In weld cells, R201 distance sensors measure the exact distance to the next part. With the help of high-precision Multi Pixel Technology, the sensors calculate position and correctly align the robot gripper. In body construction, different body parts have to be exactly aligned before they are grabbed, positioned, and welded by industrial robots. The SmartRunner light section sensor saves different reference profiles and compares them with the body parts. 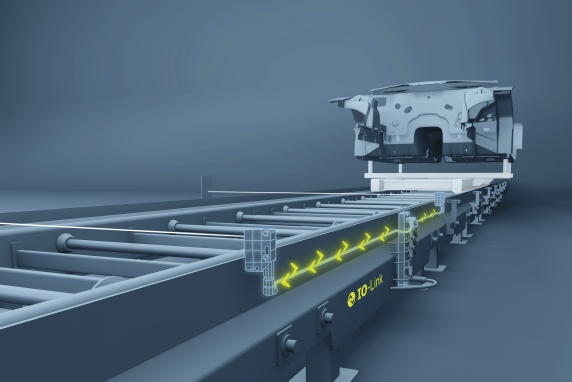 With the help of a 2-D read head and a Data Matrix code band, the safePXV positioning system enables exact positioning of monorail conveyors on production lines according to SIL 3/PL e.
Optimized for navigation of automated guided vehicles (AGVs), the safePGV positioning system delivers all values needed for both steering and adhering to safety distances between AGVs, be it in car body construction, during mounting, or on tugger trains for material feed. With more than 700 SIL/PL assessed devices, Pepperl+Fuchs offers an abundance of options from a single source, regardless of whether you’re looking for a SIL-3-rated interface module or a PL e rated sensor. In automotive production lines, SIL 2/PL d inductive safety sensors are used to reliably detect scissor lifts without a dead band. Once a lift is completely extended, safety sensors check its final position. Reduction factor 1 sensors detect different auto body parts in weld cells. The IO-Link sensors’ stability alarm registers as soon as the target moves outside the assured operating distance. As the first internationally standardized IO technology, IO-Link enables consistent, bidirectional communication between the control system and the lowest sensor/actuator level. Pepperl+Fuchs builds the bridge between sensors and Industry 4.0 with SmartBridge® technology. Integrated into the connection line between machine control and an IO-Link compatible field device, SmartBridge interfaces access IO-Link communication with the sensor or actuator and use Bluetooth to transfer the signal to a mobile device with internet access. I/O modules with integrated IO-Link master support up to eight IO-Link compatible devices. This enables continuous diagnostics and parameterization down to the sensor/actuator level while achieving absolute process transparency. Do you have any question on sensor solutions for the automotive industry we offer?